The signs are clear: Carrots, parsnips, potatoes, pumpkins and squash are on our tables. Hanging ristras, garlic braids and dried gourds are in our homes. The sun is lower in the sky and the smell of piñon is in the air. Late fall in New Mexico is here. For our farmers, preparing for winter may include broadcasting cover crops such as hairy vetch or rye to keep the soil healthy, and maybe planting garlic or shallots. Soon they will be poring over seed catalogs and planning next year’s gardens and fields. For the rest of us thinking about food, this is a great time to start cooking warm stews, nourishing soups, roasted root vegetables and holiday pies. In October, many of our state’s growers’ markets close for the season, yet the work of reinforcing our local food system continues year-round. With thoughts of Thanksgiving not far off, I am grateful for the many groups and individuals who support our farmers. Some, like the Acequia Association, the New Mexico Land Conservancy and various seed-saving networks, work hard to protect water, land and seeds. Some groups like Farm to Table, La Semilla, Southwest Organizing Project, Cooking with Kids and the Quivara Coalition, strive toward building a sustainable food system through policy work and educating the next generation of healthy eaters and farmers. Then there are the people who manage our 75 growers’ markets around the state. Mostly volunteers, they work quietly behind the scenes to make sure that every week their communities have access to the best-tasting locally grown food. You’ll never know how hard they work, but as long as shoppers come to market and support the growers, they’re happy. There are also health clinics, state agencies, school cafeterias, community gardens and many other networks that work to promote and educate us about the benefits of eating fresh, New Mexico-grown food. If it takes a village to raise a child (and it does), it definitely takes a community to support local farming. Take for instance the Rio Grande Community Farm (RGCF) located in the Los Poblanos Open Space in the North Valley of Albuquerque. This 50-acre, nonprofit urban farm grows healthy, organic food for Albuquerque schools, restaurants and stores. They offer membership in a 2-acre flourishing community garden, maintain wildlife habitat and provide educational farm visits and workshops for children and adults. Their history, too, is unique. It occupies the site of one of the earliest Spanish colonial settlements in the Rio Grande Valley. This living link to an agricultural heritage that extends over 1,700 years makes it among the oldest parcels of continually farmed land in the U.S.
Why should we care? In today’s over-processed, under-naturalized world we need to make sure children know where our food comes from. Many of us don’t have the knowledge or skills to grow our own food. To ensure this knowledge is cultivated and our natural resources protected, groups like the RGCF engage community with important hands-on learning opportunities and programs. A few weeks ago on Oct. 26, the foundation held the Pumpkin-Palooza Fall Festival to promote local agriculture. The day included a host of pumpkin-themed activities and contests, music and a pumpkin dessert recipe contest. 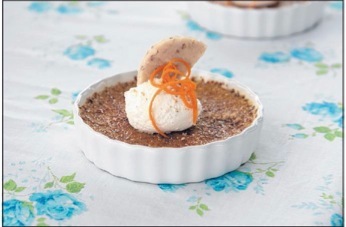 The winning recipe rocked the house — Pumpkin Crème Brûlée by Jeff Martin. It looks delicious and uses many local ingredients, but if you’re not a baker, Savoy restaurant will feature Martin’s winning dessert this Friday, Saturday and Sunday. If you’re interested in helping out — either as a volunteer or with a donation — you can visit RGCF at www.riograndefarm.org. And, if you’re ready to get your hands dirty, look into signing up early for one of their community garden plots in 2014. Winter may be on the horizon, but don’t forget the handful of markets that continue to stay open. After all, we need to keep our valiant market managers and noble farmers happy all year around.